BBC1. 4 episodes: 29 January-19 February 1977. Starring Tom Baker as ‘Doctor Who’ and Louise Jameson as Leela. 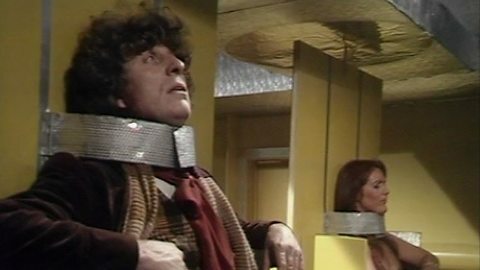 This is a new blog in which I’m going to write about my ‘top ten’ stories from classic Doctor Who. Any ‘top ten’ listing is bound to be subjective, of course, and for every Who fan who thinks ‘Genesis of the Daleks’ is the best-ever serial there will be others who disagree strongly. The real aim of the blog is to prompt a discussion about what we value in classic Doctor Who – which I’m taking to mean all television episodes from ‘An Unearthly Child’ to ‘Survival’ – and which stories best stand the test of time. It seems an apt moment at which to do this as the popular and critical success of the new series since its return in 2005 has significantly raised the bar in terms of production values and special effects. There have been some episodes of the new series that simply would not have been possible to realise during the era of classic Doctor Who. I should make it clear from the outset that I am making no assumption that the new series is superior to the classic series – nor vice-versa – but rather that the wholly different technologies and production contexts make them rather different creations. If the blog prompts fans of today’s Doctor Who to look anew at the classic series, then that will be a result in itself. I ought first of all to establish my credentials and criteria for writing this blog. I’m a cultural historian at the University of Leicester specialising in the history of British cinema and television. In 2006 I published my book Inside the Tardis: The Worlds of ‘Doctor Who’ – A Cultural History (I. B. Tauris), which was based partly on research into the production files of the classic series at the BBC Written Archives. The book had been contracted before the announcement that Doctor Who was going to return: fortunately the publication schedule meant that I was able to include a chapter on the Christopher Ecclestone series of 2005. However, for the purposes of this blog my academic interest in Doctor Who is secondary to my experience of the series as a fan. My clear memory of Doctor Who begins with ‘The Time Warrior’ (the first story of Series 11 in 1973-74) when I would have been five and a quarter. Therefore my formative years of ‘Who Watching’ were towards the end of Jon Pertwee’s Doctor and the early years of Tom Baker’s Doctor in the mid-1970s. I’m fortunate that this happened to coincide with what is now often regarded as a ‘golden age’ for the series when audiences were at their peak and Doctor Who was (arguably) at its scariest. I should explain too that I’m not starting this list with a fixed idea of which are my ‘top ten’ classic Doctor Who stories: I’m just going to choose one serial per entry and write about it. Some of these – including this first selection – will be chosen from among my favourite episodes. (I should say at this point that, as a fan, my view is that there are no outright bad Doctor Who stories but only less-good stories: hence ‘The Twin Dilemma’ is one of my 156 favourite classic Doctor Who stories!) Others I’ll choose for their significance to the history of Doctor Who either in terms of what I refer to as its internal history (i.e. the development of the fictional ‘Whoniverse’ – the mythos of the series and its characters) or in relation to its external history (i.e. Doctor Who as a television science fiction drama produced between 1963 and 1989 by the British Broadcasting Corporation). I’m not suggesting that all my favourites are necessarily landmark stories, nor do I maintain that all of the historically important stories were necessarily the best written or directed. And some I’ll choose because they seem to me to be excellent examples of a particular theme or story template that recurs throughout the series: the invasion narrative and the historical adventure, for example. In other words I’m making this up as I go! And so to ‘The Robots of Death’. 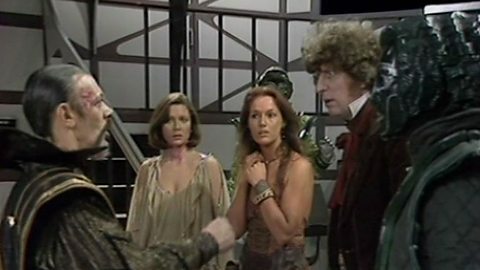 This was the penultimate story of Series 14 in 1976-77 and the second adventure for the Doctor and his new companion Leela. (For those who might not be familiar with the broadcast history of the programme, each series of Doctor Who in the 1970s ran for between 20 and 26 episodes: thus it was on air for half the year. In terms of quantity, at least, classic Who has the edge on new Who: this was long before the time when a batch of five episodes would be referred to as a ‘new series’!). It was therefore late in the period presided over by producer Philip Hinchcliffe and Robert Holmes, who in the mid-1970s had steered Doctor Who more in the direction of macabre fantasy/horror than the more technologically-driven science fiction that had characterised the previous regime of Barry Letts and Terrance Dicks. By this time Tom Baker’s larger-than-life characterisation of the Doctor as a bohemian intellectual was well established. Leela was a new companion, created by writer Chris Boucher in the previous story, ‘The Face of Evil’, and supposedly intended as a more progressive alternative to the stereotypical scream-and-shriek female companion. A warrior from the Sevateem tribe exiled by her own people – and therefore, like the Doctor, something of an outcast – Leela was an early progenitor of the ‘warrior women’ of television in the 1990s and 2000s such as Xena: Warrior Princess and Buffy the Vampire Slayer. Like those heroines she was sometimes spoken of as something of a role model for young girls – though like all such role models she was problematic and contradictory. On the one hand there is much anecdotal evidence from fans that young girl viewers, in particular, delighted in Leela’s habit of dispatching sundry monsters with her trusty hunting knife. On the other hands it was not her proto-feminist credentials that attracted male viewers both young and old but rather her habit of wearing what amounted in effect to two pieces of chamois leather that exposed just enough of her bosom and thighs to remain within the acceptable parameters of taste for Saturday-evening family viewing. This tension between women characters having greater narrative agency and their visual representation as objects of make fantasy has been a recurring one in popular film and television for about the last fifty years. As for the story itself, this is the one set on board a huge mining vehicle on a planet blasted by continual sandstorms where the human crew are being killed off one by one. As was customary in classic Doctor Who, the newly-arrived Doctor and his companion are initially suspected until a more plausible solution emerges. This seems to be a device that new Who has largely eschewed thanks in large measure to the convenient narrative device of the Doctor’s psychic paper: the ‘not believing you are who you say you are’ bit has largely disappeared. In this case it turns out that the service robots which perform all the essential as well as menial functions to keep the miner operational have been reprogrammed. Here the main reference is to Isaac Asimov’s I, Robot, from which ‘The Robots of Death’ borrows a version of Asimov’s Laws of Robotics that a robot cannot harm a human being – unless, as it turns out here, it has been reprogrammed to do so. There are other, quite subtle references to suggest that Boucher (and probably Holmes) were steeped in the history of science fiction. The real villain turns out to be a character called Taren Capel, who has come to believe that robots are superior to human beings. 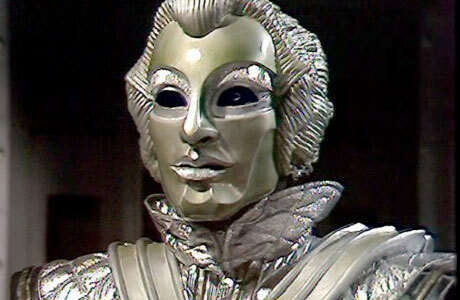 Capel might be a nod to Karel Kapek, whose play RUR (Rossum’s Universal Robots) is generally held to have introduced the term ‘robot’ into popular culture. The idea of the robots as a subservient class who are sparked into a revolution – to make the point clear the Doctor refers to Marie Antoinette – was a theme of RUR. Of course the similarity might just be a coincidence, but when another character is called Poul one starts to suspect that the references are conscious: Poul Anderson was a science fiction author whose novel Guardians of Time – about a group of interstellar police whose role is to prevent interference with time – was an influence on the early development of the concept of Doctor Who. The BBC production files do not reveal whether these references were a deliberate strategy to locate Doctor Who in the history of science fiction across other media. But they do show that throughout the 1970s, successive production regimes were keen to distance the series from its association with juvenile entertainment. Critics of Doctor Who have long maintained that it is more a fantasy than ‘hard’ science fiction: but in fact the series has often drawn upon themes and motifs from literary science fiction as well as popular fiction. Otherwise what raises ‘The Robots of Death’ above the level of good Doctor Who to rank among the best of the classic series is its visual style. 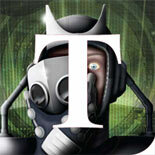 ‘The Robots of Death’ is, quite simply, one of the most brilliant examples of design in the series’ history. Kenneth Sharp’s set design and Elizabeth Weller’s costumes employ a stylised Art Deco ‘look’ that creates a consistent visual style for the serial. It’s an example of style taking precedence over narrative rather than the usual principle that the work of the design departments is to support the story-telling. (The BBC production files reveal why so many Doctor Who stories were set on forest or jungle planets: the Design Department could do an excellent jungle set at Ealing Studios but desert landscapes always ended up looking like the same quarry.) Here the sets and set dressings are quite sumptuous and the costumes are highly extravagant. The ‘Voc’ robots with their quilted body garments and face masks designed to resemble Greco-Roman sculpture are unlike any others in popular science fiction. This contributes enormously to the effect of the serial: the robots’ semi-human appearance and soft speaking voices make them so much more menacing than the standard robot design of bulky metallic bodies and silver surfaces. One only needs to compare the ‘Voc’ robots to, say, the White Robots of ‘The Mind Robber’ or even the Giant Robot of ‘Robot’ to realise just how innovative their design was. Indeed this is one aspect of the classic series that had some influence on new Who, as seen in the faces of the Heavenly Hosts in ‘Voyage of the Damned’. ‘The Robots of Death’ is evidence that even on the standard BBC drama budgets of the time, Doctor Who was capable of achieving excellent results. The old joke about the series’ wobbly sets was in fact rarely appropriate: the technical shortcomings of classic Who were usually in other areas than design. And it’s for its design and visual style that, in my view, ‘The Robots of Death’ deserves its place in the pantheon of classic Doctor Who. This entry was posted on November 13, 2014 by Who Watching in Classic Doctor Who and tagged Chris Boucher, Doctor Who, Louise Jameson, Michael E. Briant, Philip Hinchcliffe, The Robots of Death, Tom Baker, Top Ten.